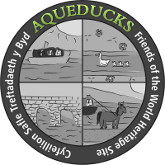 Welcome to the official ‘Aqueducks’ website, the on-line home to the Friends of the Pontcysyllte Aqueduct and Canal World Heritage Site. The Aqueducks group was formed on the 6th August 2010, at Trevor Basin, Pontcysyllte. Over the last 2 years we have been committed to hosting events and highlighting the truly exceptional beauty of the 11 miles of World Heritage. 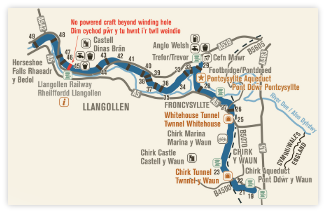 We are made up of community representatives from the 11 mile canal corridor that is the Pontcysyllte Aqueduct and Canal World Heritage Site. The canal became a World Heritage Site in June 2009 and was as a result of years of hard work by the 3 local authorities and local communities along the canal. The communities have played a vital role in getting the status and now we can focus on moving forward and become involved in the management of the site and also develop events and activities for communities and visitors to the canal. Not only did communities want to form a group but this is also a requirement of the World Heritage Site Status. Explore the history of the men behind one of our most technological triumphs of British Civil Engineering of the time. Thanks to all who submitted pictures for inclusion in the first aqueducks 2014 Calendar. Click on the buttons below to see the winning pictures and to pre-order the 2014 calendar for delivery from Wednesday 18th December 2013. Details of places to purchase the calendar in North Wales will be made available on facebook and twitter. Aqueducks has been working for the past few weeks on getting a username for our Pontcysyllte Aqueduct page. It appears that some cyber squatting was in operation that was preventing us from getting the username for our original Landmark page. With the help of facebook this has now been given to us. We have the great pleasure in welcoming old and new visitors to our facebook page. Did you know, aqueducks has a YouTube Channel? 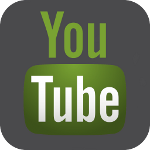 Our new YouTube Channel is live and growing by the day. Keep coming back to see clips of the exciting work we are doing along the 11 mile stretch of Pontcysyllte Aqueduct and Canal World Heritage Site. Aqueducks are proud to acknowledge the generous donation of more than 500 slides from the 11 miles of the World Heritage Site. Neville Hurdsman, local historian and author of 2 books, “A History of the Parish of Chirk” and “A History of the Parishes of St. Martin's and Weston Rhyn”. Neville has had a passion for local history all his life and has spent thousands of hours using photography to document local buildings and architecture. He was also given unprecedented access to Chirk and Brynkinalt achives which fuelled his passion for cartography . We are currently digitising the slides and will be unveiling them here on aqueducks.org website very soon. Following on from our ‘Technology in Heritage’, we feel honoured that Neville’s family has entrusted his collection to us for Heritage preservation. Sadly, Neville passed away in March 2013.